Volumetric analysis through oxidation and reduction, is based on reactions which involve the transfer of electrons from a molecule, atom or ion to another chemical species. The cerium removes electrons from the iron, and is termed the oxidizing agent as it is reduced in the process and its oxidation number decreases. The iron, which donates electrons to the other chemical, is termed the reducing agent because it is oxidized, and thus loses electrons thereby increasing its oxidation number. Reduction: the gain of electrons by a molecule, atom, or ion. 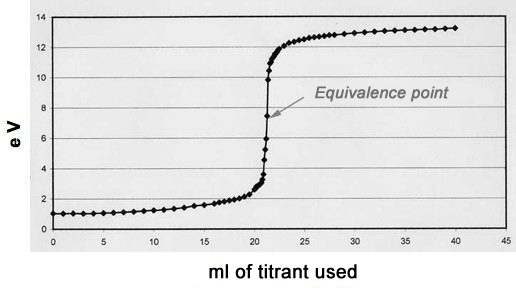 In oxidation reduction reactions, the titrant is usually a strong oxidant because if we use reducing agents there can be too much interference from the o2 present in the atmosphere. the strength or tendency of the electrons to be transferred, i.e. the intensity of the oxidization or reduction (oxidation reduction potential expressed using the Nernst equation). The Nernst equation expresses the electrode potential of a pair of electrodes, or of a semielement of a battery compared to standard electrode potential. In other words, the equation enables us to calculate electrode potential in non-standard conditions. [Ox] is the concentration of the reducing agent (or oxidized species). The concentration of the oxidized and reduced species is the equivalent of the activities in dilute solutions. if the reducing agent has an E0 which is clearly higher than that of the oxidant, the two substances do not react. There is a redox system whereby the oxidized form (Ox) is a different colour from the reduced form (Red). 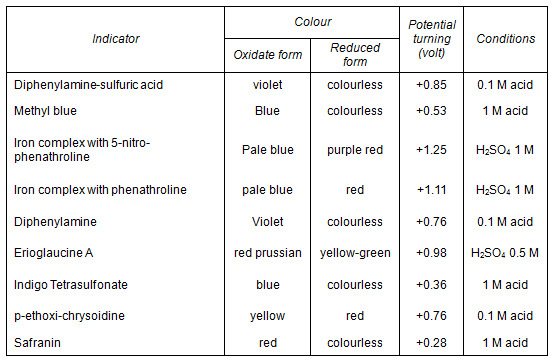 As with acid-base indicators, the colour change occurs within a specific interval (turning interval). The colour of In (Red) dominates when [In(Ox)] / [In(Red)] <0.1 and it is only in this condition that the colour change can be noted. Some reactives are highly coloured, so if they are used to excess, or if they disappear, there will be an obvious colour change. For example, the oxdized form of permanganate is an intensive violet (even for concentrations of < 10-5). I2 in the presence of a starch indicator turns an intense blue. Permanganate is a strong oxidant, and this means that it should not be used in chemical analysis because its organic substrates are not only titrated but also degraded. In permanganometry no indicator is used. The end point of titration is clearly visible because the solution turns an intense purple colour when the permanganate is in excess. Not very selective where reducing substances are concerned.